Taking an action on the Art Nouveau board requires playing an Assistant pawn and placing a bid in Belgian francs (BF), which allows participation in an auction. At the end of each round, the player who bid the most money in a column wins this column's auction and its Bonus card. The actions of the Brussels board, on the other hand, are free, but are not looked upon kindly by the Justice. Thus, at the end of the round, the player who played the most Assistant pawns on this board loses one, who must explain himself at the Courthouse. 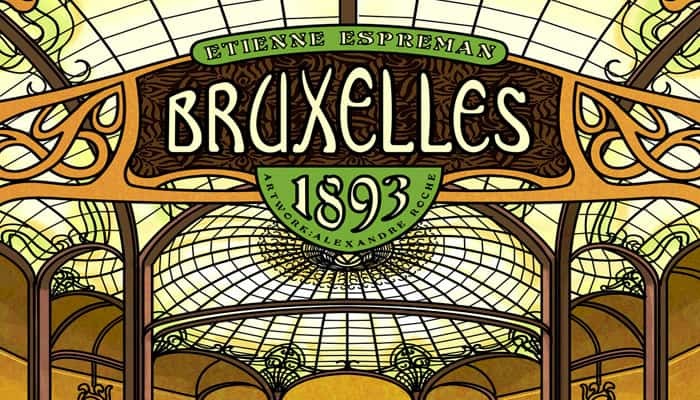 In Bruxelles 1893, you represent one of the famous architects who established the reputation of Art Nouveau in the Belgian capital. masterpiece, shown on your personal board. It is also possible to develop your reputation as an architect, increase your influence at the Royal Palace or City Hall, and even benefit from Public Figures that you meet during your theater outings. The architect who garners the most fame in the form of victory points (VP) wins the game! 1 Randomly assemble the 5 Action strips and place them above the Bonus strip to form the Art Nouveau board. Place the Art Nouveau board to the right of the Brussels board. Important: For your first few games, do not use the side of the strips with the Iffl symbol. These faces are reserved for experienced architects. 2 Each player takes his personal Architect board and and the Building tiles corresponding to the color he chooses to play. He places the 6 Building tiles on the spaces provided on his Architect board. 3 Each player receives 4 discs and 7 Assistant pawns in his color. He places 5 Assistant pawns near his personal board and 2 on the Courthouse space of the Brussels board. On space 0 of the scoring track. This disc tracks the victory points (VP) he earns over the course of the game. 5 Each player receives a Public Figure card that can earn him 5 BF (Georges Brugmann), and places it near his personal board. With fewer than 5 players, the unused Georges Brugmann cards are returned to the box. 6 Sort the turn-counting Exhibition tiles by year (1893-1910) and place them face-down on the space provided on the board. Turn over the first card to show the exhibition poster. (7 Place the Workshop cursor at the center of the "workshop" on the Brussels board. 8 Shuffle the Public Figure cards and place one face-up on each of the four spaces on the right in the Royal Theater, on the Brussels board. The remaining cards form a deck that goes in the Royal Theater space on the left. 9 Shuffle the Stock Exchange cards to form a deck, and place it on the Stock Exchange space on the board. 10 Separate the color Work of Art tiles and the black Work of Art tiles. After shuffling them, place the color Works of Art in a face-down stack next to the gameboard. Place the black Works of Art in another stack. Each player starts the game with a color Work of Art drawn at random and placed near his personnal board, face-up. 11 Position the 2 needles of the compass as shown in the illustration. Randomly place the 6 compass tiles on spaces provided around the compass. Note: For your first game, attach the two needles to the board with the little plastic rivet. 12 Shuffle the 25 Bonus cards, form a deck, and place it near the gameboard. Place one card face-up on each of the spaces of the Bonus strip. 13 Choose a first player, who receives the Manneken Pis pawn and 5 BF. The players sitting to his left receive 6 BF, 7 BF, 8 BF, and 9 BF, respectively. 14 The remaining money and materials cubes form a general supply near the gameboard. The game is played over 5 rounds represented by the 5 Exhibition tiles. Each round comprises four phases: the Stock Exchange phase, the Action phase, the Resolution of the Turn phase, and End of Turn phase. The first player reveals the top Stock Exchange card of the deck and places it face-up atop the deck. The information on this card will determin the available play area of the Art Nouveau board for the coming round. Each line of the Stock Exchange card corresponds to a different number of players, indicated by these icons. Read only the line that corresponds to the number of players participating in the game. On the Art Nouveau board, there are shields for the City of Brussels at the intersections of the 25 action spaces. These shields are organized in rows and columns numbered from 1 to 4. Each line of the Stock Exchange card contains 2 pairs of numbers. Each pair of numbers defines a shield on the board (the first number designates the row; the second, the column). The first player must choose a shield from the two proposed. Note: To help you better visualize the two shields, you can place white cubes on them temporarily. By tracing a horizontal line and a vertical line passing through the selected shield, the Art Nouveau board is divided into 4 distinct areas. The first player places the Bracket tile on the shield he has chosen. The bracket should be oriented to designate the largest of the 4 areas (the largest area is the one that contains the most Action spaces). This area is the area of the Art Nouveau board available for the current round. During each round, the players use their Assistant pawns to perform actions on the Art Nouveau board or on the Brussels board. Beginning with the first player, then going clockwise, each player performs one action until all players have passed. The action can be selected from those in the available area of the Art Nouveau board or from the 4 actions of the Brussels board. In order to take an action on this board, the player must place an Assistant pawn on an action space in the avai- lable area (the area defined in the Stock Exchange phase). He must accompany his assistant with a bid of his choice of at least 1 BF (we suggest that you place the coins in a stack under the Assistant pawn). This also allows you to participate in the auction for the Bonus card situated at the bottom of that column (see Resolution of the Turn Phase). The player then immediately performs the action corresponding to the chosen Action space. Each Action space may be used only once per round, so there can never be two Assistant pawns on the same Action space. The player creates a work of art in his studio. He draws a Work of Art tile from the stack of color Works of Art; if he possesses one or more Exhibition tiles, he draws the same number of additional Work of Art tiles. Now he chooses one tile, places it face-up in front of himself, and returns the others to the stack. Note: If the available color Work of Art stack or/and the black Work of Art stack becomes empty, make two new stacks from the face-up tiles in the shop, making sure to leave the top 2 tiles in place (see below). The player can move the Workshop cursor, horizontally and/or vertically, a number of spaces equal to the total number of works he has in front of him. From among his Work of Art tiles, he chooses one whose color is different from those of the two works of art visible in the shop. It is impossible to sell a work whose color is already displayed in the shop. He immediately receives the money and VPs indicated by the Workshop cursor dot that is the same color as the work he sold. The dot's row indicates the monetary income, while the column indicates VP income. Then he places the sold Work of Art tile on one of the two spaces in the store. For the first 2 sales of the game, he is required to put the work on an empty space. Later, he can choose whichever space he wants, covering the work of his choice. This choice is important because the color of the covered work will again be allowed to be sold at the next sale. The player approaches a Public Figure of Brussels during a theatrical performance in order to enlist his services. The player chooses a Public Figure card from the 4 cards of the display. The card on the right is free, while the second costs 1 BF, the third costs 2 BF, and the fourth costs 3 BF. The money paid is put into the general supply. The player immediately performs the action of the selected Public Figure card (see Appendix 1 for an explanation of the cards). Two options are then available to him: Either he discards the card and benefits from it no further, or he keeps it and places it in front of him, rotated 90° clockwise, indicating that the Public Figure has been used this turn and can't be used any more. In this case, the player must keep the card until the end of the game, without any way to dissociate from the Public Figure. It may harm him in the endgame, because he will then have to pay the amount indicated on the card, with the risk of losing 5VP if he can't. It is impossible to keep two identical cards (but you are allowed to approach a Public Figure identical to a card you've already kept, provided you choose to discard the new one). The number of Public Figure cards that each player can keep in front of him is unlimited. In subsequent rounds, each Public Figure card can be activated again by the Grand Plaza action or Royal Theater secondary action. Finally, the player must shift the Public Figure cards in the display to the right so as to fill the gap created by his action. He then reveals the top card of the deck he places on the 3 BF space. The player gets 2 Noble Materials cubes. He takes two noble materials of his choice (wood, stone, and/or iron). He can take two different materials or two identical materials. He cannot choose a white Joker cube. If there are no more materials available in the general supply, he simply can't take them. He must pay a construction cost as defined by the compass (see the Compass rules). The construction cost depends on the row of the personal board from which the Building tile comes. The lower tiles cost 2 construction units, the middle ones cost 3, and the upper ones cost 4. The player must first build the two lower tiles before building those in the middle, and must build the middle ones before those at the top. Important: Each construction unit can be replaced by a white Joker cube (for example, it is possible to pay 1 white cube instead of 3 BF). If the player has not played any white Joker cubes in paying its construction cost, he immediately gains 5 VPs. If he has played at least one Joker cube, he does not earn the 5 VPs. Note: Playing more than one Joker cube has no more effect than playing just one. The player must turn one of the two compass needles one space clockwise. The needles are never allowed to point at the same box. The player places the constructed Building tile on an empty Action space on the Art Nouveau board. This space does not have to be in the area made available for this round. On the other hand, there must be no Assistant on this space. Now, the player will receive a secondary action whenever an opponent chooses to place an Assistant on this space (see Appendix 2: Secondary actions on the Art Nouveau board). Each of the 2 Building tiles from the top row immediately give the player 5 VP as it is constructed. At the end of the game, each constructed Building tile gives the player a number of VP equal to his reputation level on the Architect track on his personal board. The 2 compass needles always show 2 different spaces, and thus 2 different construction units. The player must use each of the 2 constructions units indicated by the 2 compass needles each time he builds. If he has to pay 2 construction units, he has to pay 1 unit of one type and 1 unit of the other type. If he has to pay more than 2 construction units, he can pay however much he wishes in each type, as long as he pays with both types of construction unit specified by the two compass needles. If a needle points at the "1 noble material of your choice" space, he can pay that construction unit with any noble material he wishes, but he still has to pay at least one of the construction unit indicated by the other compass needle. If a needle points at the empty space, he must pay the entire construction cost with the construction unit indicated by the other compass needle. Example: The green player must pay 4 construction units to build one of his higher Building tiles. One compass needle indicates wood while the other shows the empty space: He must pay with 4 wood cubes. Unlike the actions of the Art Nouveau board, the Brussels actions do not require money, and can be performed by multiple players in a single round. The first time a player wants to take an action in a given round, he must place one Assistant pawn. The next player (which could be the same player) to use the same action that round must place two new Assistant pawns. At the market of Place Sainte-Catherine, the player receives 3 white Joker mate- rials. These Joker materials can replace any construction unit during the construction of a Building tile. The player gains a sum of money equal to the value indicated at the top of the Stock Exchange card revealed in the Stock Exchange phase. The player has access to one action of his choice from the 5 actions of the Art Nouveau board. 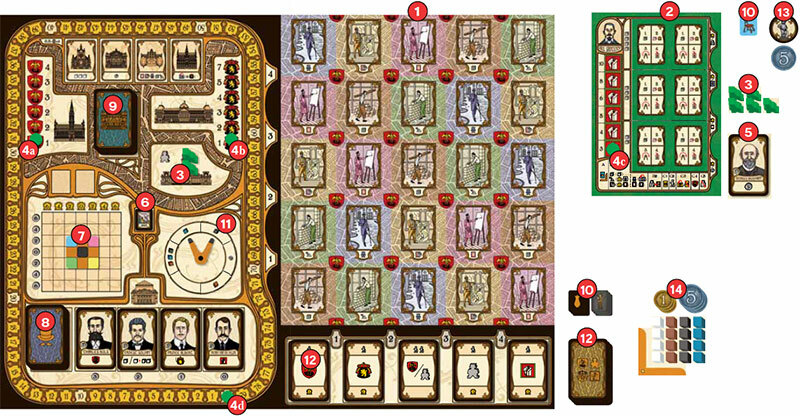 The player does not place an Assistant pawn on the Art Nouveau board. It is always possible to choose an action even if it is not currently available on the Art Nouveau board. Taking this action does not cause the player to participate in an auction on the Art Nouveau board. Important: In 4- and 5-player games, the actions of the Brussels board are available twice. This permits the second player who chooses an action to use it with only one assistant. The third and fourth players to use the action would need 2 assistants, and so on. rotated 90°) can be activated. 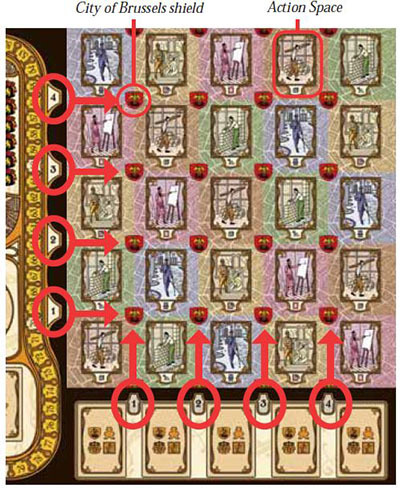 The maximum number of cards that the player can activate with each Grand Plaza action depends on his influence at the Royal Palace, i.e. the position of his disc on the Royal Palace track. Each Public Figure card activated must be rotated 90° clockwise. When a player cannot or does not want to perform an action in the current round, he passes when it is his turn. The first player to pass takes the Exhibition tile for this year, places it in front of himself, and receives 1 BF + 1 BF per color of Work of Art in his possession (thus the maximum income is 6 BF). He participates in the exhibition as a guest of honor. This tile will also enable him to draw an additional Work of Art tile during future Workshop actions. The other players continue to play until they also pass. When the other players pass, they each earn 1 BF per color of Work of Art in their possession (thus their maximum income is 5 BF). When all players have passed, the Resolution of the Turn phase begins. The player who placed the most total money in a column (add up each player's individual bids) wins the Bonus card placed at the bottom of this column. He places the card near his personal board. In case of a tie, each player involved in the tie benefits from the central power, but the card is discarded. Each player adds up the number of Manneken Pis that he earned in that round. There are 0, 1, or 2 Manneken Pis on each Bonus card earned during this round, and 2 Manneken Pis on the Exhibition tile that the first player to pass got. The player with the highest total is the new first player. In case of a tie, the tied player who is the first one clockwise from the current first player becomes the new first player. The new first player takes the Manneken Pis pawn. Note: This does not include Bonus cards and Exhibition tiles gained in previous rounds. Players who won one or more Bonus cards during phase ''1. Bids on the Art Nouveau board'' can use these cards. tucking the card under his personal board. This Bonus card allows you to advance your disc 1 Coat of Arms space on the Royal Palace track. This Bonus card allows you to advance your disc 1 Shield space on the City Hall track. Certain cards permit you to choose between 2 powers. This Bonus card allows you to advance your disc 1 space on the Architect track of your personal board. This Bonus card allows you to retrieve an Assistant pawn from the Court- house. If you have no Assistant pawn in detention, this has no effect. Others permit you to benefit from a double power. Note: A Bonus card is discarded after using its central power. The player tucks the Bonus card under one of the four rows of his personal board. Each row acts as a multiplier for endgame VPs awarded for things in your possession at that time. The cards must be positioned so that each VP symbol is clearly visible. Each row has 1VP symbol built in, even if there are no cards tucked under it. Row 1: For each set of 4 BF in his possession, the player will earn as many VPs as VP symbols present in this row. Row 2: For each Work of Art still in his possession, the player will earn as many VPs as VP symbols present in this row. Row 3: For each Public Figure card in his possession, the player will earn as many VPs as VP symbols present in this row. Row 4: For each Assistant pawn beyond the second in his possession (in other words, the number of Assistants minus two), the player will earn as many VPs as VP symbols present in this row. Assistant pawns in the Courthouse do not count. Important: During a single round, a player cannot place two cards in the same row. Note: The cards without any VP symbols cannot be tucked under the board. Examine each City of Brussels shield on the Art Nouveau board one by one. Check for majority around any shield that has 4 Assistant pawns around it. The player who placed the most of the 4 Assistants around the shield earns a number of VPs equal to his level of influence on the City Hall track. In case of a tie, each player involved in the tie receives their full VPs. Note: The money bid has no influence on this majority. Identify the player who placed the most total Assistant pawns on the 4 action spaces on the Brussels board. That player must move one of those Assistant pawns onto the Courthouse space. In case of a tie, each player involved in the tie must send one of his Assistant pawns to the Courthouse. Each player retrieves his played Assistant pawns, except those detained at the Courthouse. The money bid on the action spaces of the Art Nouveau board goes back into the general supply. Each player turns his rotated Public Figure cards upright, in order to make them available again. Reveal the Exhibition tile for the new round. Discard the Public Figure card from space 0 of the Royal Theater, then move the other cards to the right to fill the gap. Then reveal the top card from the deck and place it on space 3. Bonus cards still on the board are discarded. Then draw 5 new cards from the deck. Note: At any time during the game, when the stack of Public Figure cards is empty, shuffle the cards from the discard pile to create a new draw deck. At the end of the 5th round, the game ends after resolving the majorities on the Brussels board. Proceed directly to the final scoring, skipping the End of Turn phase. Each player must pay the amounts indicated on the Public Figure cards that he kept. For each Public Figure card he doesn't pay, the player loses the card and 5 VP on the scoring track. The VPs accumulated on the scoring track during the game. The VPs from construction: Each Building tile he built earns him as many points as his level on the Archi- tect track of his personal board. The VPs earned from Bonus cards tucked under his personal board. The player who finished with the Manneken Pis pawn gets 5 VP. Example: The green player has 5 Public Figure cards for a total value of 15 BF. Because he has only 12 BF, he pays 11BF and says farewell to a 4 BF Public Figure; and he loses 5 VPs. The 2-player game takes place in exactly the same way, with one exception: Each player starts the game with an Assistant pawn of a neutral color (selected from the unplayed colors). At the start of the Action phase, starting with the first player, each player must play a neutral Assistant pawn on an Action space of the Art Nouveau board. This space must be part of the available area of the Art Nouveau board. There cannot be a Building tile on the chosen space (if no empty space is available, the player simply does not play a neutral Assistant). No bid shall accompany the neutral Assistant. These Assistant pawns are taken into account when deter- mining majorities on the Art Nouveau board: If the neutral color wins a majority, no players earn any VP. Note: but this isn't true in the event of a tie.